Welcome back to your summer home, campers! Camp Sabra’s 50th Birthday Bash! Celebrate at Sabra! 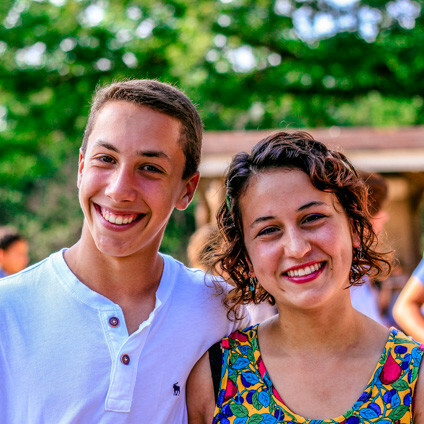 Spend a weekend at the Lake and relive the Camp Sabra magic. For more information, contact Terri Grossman, 314.442.3180. We host great annual events for our camp alumni. Relive your nights by the campfire at on-campus events or meet up with your fellow alumni in the city of your choice. Keep up-to-date on our upcoming events by joining our alumni mailing list. Miss the feel of camp? The endless fun? The campfires and s’mores? Bring your family to one of our family retreat weekends during the summer. “Dad & I” is wonderful weekend program each May for dads (or other important male figures) and kids (pre-K to 6th grade). Two family weekend programs are held each summer (Memorial Day and Labor Day weekends) for you to enjoy camp activities with your family. Click here for more information.